The hw design of the Enterprise is originally ready for 6MHz model. The most important evidence about it is the option bit in the Dave (at port BFh), set the Dave sound frequency divider for the 4 or 6 Mhz system. Very strange - why was 6Mhz machine not released? I think this is because of cost reduction... but make some additional work when want to make a Turbo Enterprise. The 8MHz System Clock come from U18 Pin 12, need to cut this output line. Unfortunately it is hard to access, the best way is removing U18 and restoring it after cutting. Next: cut the System Clock from the Expansion Connector then connect the A23 pin to original 8MHz clock at the U18 pin12. Then a new clock source is needed, 5V TTL compatible oscillator is the easiest solution, can be piggyback on U8, GND and VCC pins connected to the IC GND and VCC pins. The clock output goes to the U18 pin 1 which are the input for the new System Clock. The 7.12MHz turbo is a cheaper trick because no new clock generator is needed, using the 14M Video Clock! All same as above, just instead of the oscillator output, connect the U37 Pin 10 (Video Clock) to U18 Pin 1 as System Clock. Many Z80A work at 7.12MHz but it is more possible that it needs to be replaced. On some motherboards some problem can be found with the video memory on turbo speed, then short circuit R12. On higher speed (10MHz ) also needs removing C7. 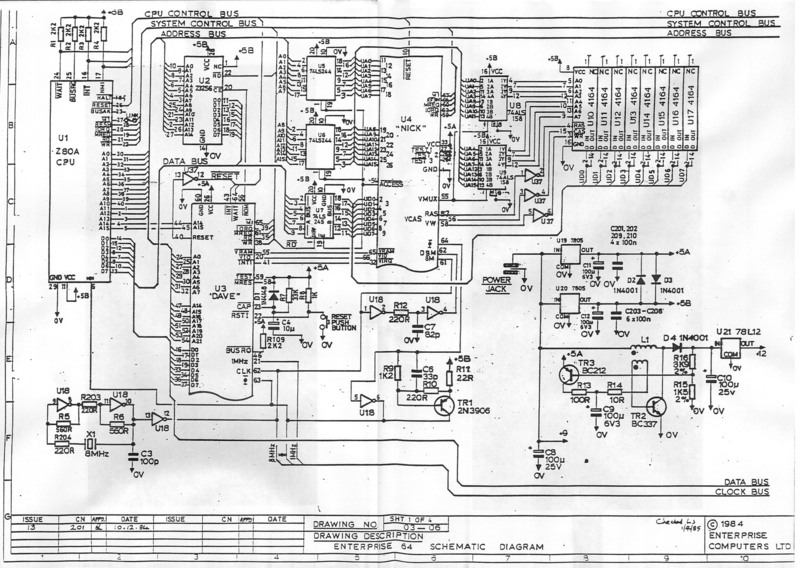 There is a schematic for 74xx157 as switch. You can see it on the last photos. Some other modification: with EXOS 2.3+ possible detect with phantom bad segments, especially on a turbo speed. This because the data bus don't have pull-up resistor inside the machine then it is floating. Some external devices for example the MICROTEAM EXDOS card have a onboard pull-up resistors then when using the machine with this card the problem solved. I'll read it more carefully. Need to double check the 74xx157 installation and 10Mhz details, not sure at all about how to get this speed. - 20MHz 5V TTL crystal oscillator, for example this. Cuts and wiring see previously. R12 needed to short circuited and C7 removed. 157 installation: you can see on the photos, and schematic. 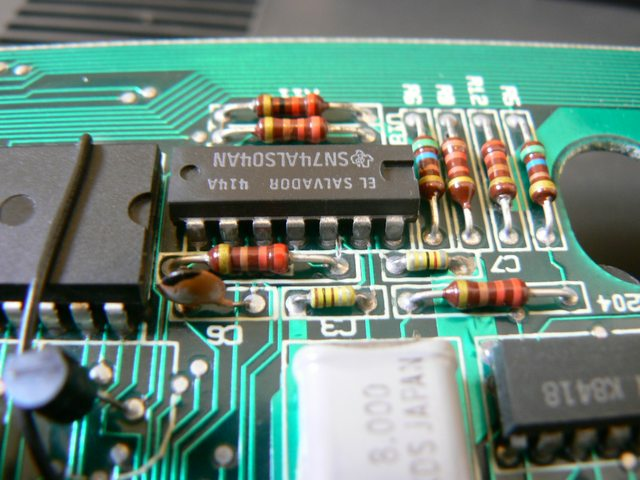 it is piggyback on the onboard multiplexer (157 or 158), pin 8, 15 and 16 connected to the onboard IC, these are the GND and VCC pins. Other pins are "floating" in the air. Pullup resistor added between pin 1 and 15. Pin 5 connected to U18 pin 12 (8MHz), Pin 6 to oscillator output (Turbo Clock), Pin 7 to U18 pin 1 (System Clock). I added a connector for the switch, because the switch glued to the case under the keyboard. The connector will be good if needed to remove motherboard from the case. Connector pin 1 at the 157 pin 1, connector pin 2 to GND. If you use two circuits switch then you can made a Turbo LED: replace the power LED with bi-color LED (3 pins type), one color conected to the power led pins, second color controlled with the switch. First I thought Dave needed a heat sink. But now I looked at it after running a few hours at 10MHz, it is only about a hand temperature! I think about 40 celsius. Great, thanks again!. what about the onboard RAM, I have saint's expansion but also old 64kb in my ep64. Onboard RAM accessing controlled by Nick and using fixed timing. Only some adjust needed this the short circuited R12 and removed C7. If it is with 150ns ICs then will work with 10MHz. Great, need to check them tho, I'm not sure about their speed. About the ROMs, I've just ordered 10 W27C512-45 pieces. They're cheap and I hope being 45ns, they would be enough fast! Yes, you can use any slower crystal for slower CPU speed. For a 7.12Mhz CPU not needed additional oscillator just use the Video Clock as System Clock. Notice the green led, I followed Zozo's suggestion and replaced the original led by a bicolor one, it's very handy to know when you're in turbo mode! This is the 032383 S/N machine? I will update notes at inventory When adding the pullup resistor can you view the motherboard ISSUE? Yes, the machine is the 032383 S/N one. The CPU is still the original, it doesn't get very hot . I'm waiting for some thermal pad, then I'll add a heatsink just to be safe. And given your photo, the pullup resistors are 4K7Ohm? 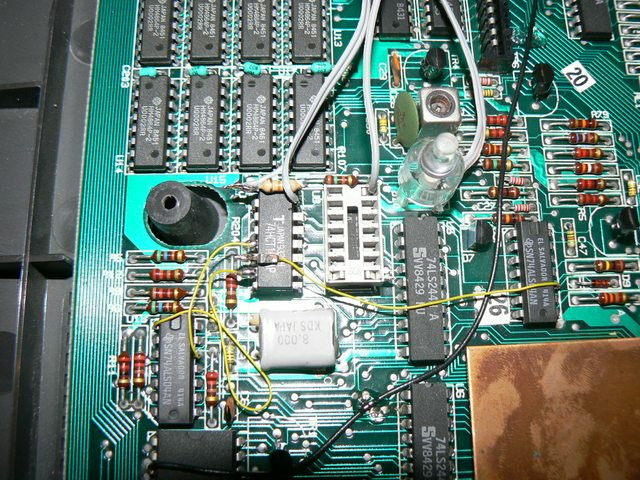 I've piggybacked 157 over U9; but you can also see a DIP14 socket over U8, I've also installed this to be able to mount a new oscillator and try with different speeds, specially if I finally replace the CPU with a CMOS one. About my EP64, where can I check the issue? From top view: check the monitor connector, if all pins are present then it is ISSUE 6. If some pins are missing, then check the company name at the left side of the mb. If it is ENTERPRISE then it is ISSUE 5, if FLAN then it is ISSUE 4.